If you have a high-end virtual-reality (VR) headset these days, it will likely have a few cables for video, power, and USB. This can be a bit cumbersome and non-standard, especially if it involves a combo cable. 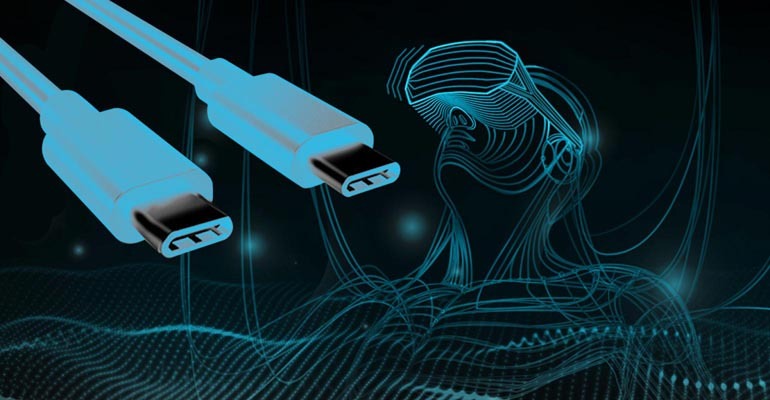 New virtual-reality systems will be able to pack everything into one standard package by taking advantage of USB Type-C’s (USB-C) alternate mode. Alternate-mode standards already exist to deliver HDMI and DisplayPort. 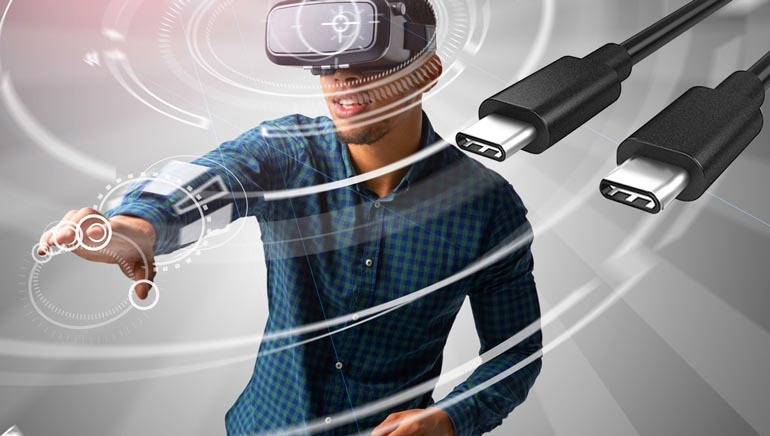 USB Type-C connectors have been popping up on most new systems from smartphones to laptops. It typically provides USB 3.x support as well as the Power Delivery (PD) part of the standard. This allows a single cable to be used for power and data. Type-C PD support is also bidirectional. Thus, a device, say a monitor, that’s plugged into a wall for power could provide power to a laptop or smartphone that’s driving it. Delivering power is less of an issue with VR headsets, which will only consume power. But the PD standard means there’s now a standard way to provide power instead of a plethora of power bricks. Which brings us to VirtualLink (see figure). VirtualLink is a standard from the VirtualLink Consortium. Initial promoters include NVIDIA, Valve, Oculus/Facebook, AMD, and Microsoft. It uses the alternate mode to deliver four lanes of HBR3 DisplayPort for high-resolution displays, USB 3.1 Gen2 SuperSpeed for headset cameras and sensors, and up to 27 W of power. The new standard should improve the user experience as well as provide a standard interface on the VR headset as well as the delivery system, be it a GPU board or smartphone. Of course, implementing the standard isn’t simply a matter of using a standard USB chipset. It requires chipsets that support the alternate mode and VirtualLink in particular. Likewise, implementing other alternate-mode support for a given device will require additional design choices and costs. Still, supporters are enthusiastic about VirtualLink’s possibilities. “We hope to see the results of this collaboration enhance the user experience and extend the possibilities for all developers and hardware manufacturers,” says Pierre-Loup Griffais of Valve. “We have been involved on VirtualLink from the beginning and are supportive of industry-standard approaches for emerging Windows experiences including mixed reality,” says Scott Evans, general manager, Mixed Reality at Microsoft. VirtualLink is also applicable to augmented-reality (AR) and mixed-mode solutions. VR headsets that support VirtualLink are on the drawing board but haven’t been delivered as of yet. One can expect that most new VR headsets will take advantage of the standard.